So here we go again for Indian Wells. Intrigued as ever to see if this draw will hold up. Gone for more upsets than I normally would but hoping we see a little more stability. Halep d. Strycova in 3 sets – This could be a great match. Wish I could write a preview for it but I wasn’t able to watch either of their matches on Sunday. Halep was great in her match against King and by all accounts, against Makarova too. Strycova is having a super year too. Going for Halep but expecting a battle. Kvitova d. Gibbs in 2 sets – A bit wary on this one but in the end, gone for a clean Kvitova win. Gibbs has had a brilliant week but I wonder whether it may catch up with her in this one. Kvitova hasn’t exactly been convincing but the way she battled to those wins might be the key to some better form around the corner. Vinci d. Rybarikova in 2 sets – Rybarikova leads the H2H, 3-1, but Vinci’s form of late has been sparkling. Konta d. Pliskova in 3 sets – Pliskova leads the H2H, 3-0 but Konta’s been on the rise since their last match-up. Just a feeling for Jo in this one so will go with my instinct. Favourite match of the day is Bacsinszky-Kasatkina! With both playing long matches on Monday, it will most likely depend on who recovers the better. Two of my favourite players so hope it is a great match and happy either way. McHale d. Stosur in 2 sets – Stosur leads the H2H, 3-0 but i’ve been so impressed by McHale in her first two matches who has had a solid start to the year… i’m willing to make a potential fool of myself and go for this one. Kasatkina d. Puig in 3 sets – Still gutted we didnt get Daria v CSN. Puig’s looked super this week and there is a fear she could overpower Kasatkina. I’ll stick with the Russian to R4. Konta d. Allertova in 3 sets – Big fan of Allertova and gutted I didn’t have more faith in her yesterday. I think a decent performance from Konta though might win this one. Konta won easy at the AO but I think Allertova had an injury. Thoughts – A good day apart from going for CoCo over JJ! Radwanska d. Niculescu in 3 sets – This will be a significant test for Radwanska. She hasn’t responded well after marathon matches so could see her coming unstuck trying to get past Niculescu. Kvitova d. Larsson in 2 sets – hmmmm never sure with Petra but having come very close to losing in the second round, she may be boosted here. Gavrilova d. Rybarikova in 2 sets – No hesitation with this one, I think Dasha comes through. Love Magda though! Puig d. Schmiedlova in 2 sets – Schmieds concerns me with her serve and general game so far this year but really hope she can improve here. Puig won their last match in Sydney for the loss of just one game! Petkovic d. Strycova in 3 sets – Tough one, last year would have gone against Petko but she is regaining her status as one of the most consistent players on tour. Plus, she owns this H2H. Strycova has been playing some great tennis so should be one of the best matches of the day. Makarova d. Hradecka in 3 sets – Makarova won comfortably in Brisbane but has been on a dire run of form. Hradecka’s not been much better this year but did look solid in the first round. Going with Maka but will really show whether she is slumping right now. Kvitova d. Kovinic in 2 sets – Don’t fancy Petra to struggle but famous last words! Beck d. Mattek-Sands in 3 sets – BMS has struggled in singles this year with just two wins in Doha qualifying. Beck has lost her last three matches and does have a habit of going on these barren runs of form. On the fence but edge to Beck. Gasparyan d. Govortsova in 2 sets – Gasparyan has won at least one match at every tournament she has played this year. Very impressed with her consistency so far and fancy her to win this match. Diyas d. Loeb in 3 sets – Diyas has struggled so far in 2016 but should have enough quality to win this match. Zhang d. Parmentier in 3 sets – On the fence with both playing well lately. Zhang won an ITF title after her majestic run at the AO, while Parmentier has won eight out of her last ten matches. McHale d. Garcia in 3 sets – McHale leads the H2H, 2-1 and Garcia had an injury in Monterrey last week. Kasatkina d. Hantuchova in 2 sets – A good draw for Kasatkina although slightly wary, even if Hantuchova hasn’t won a MD match since July. Puig d. Lucic-Baroni in 2 sets – Normally i’d go MLB but siding with Puig on this surface. Bouchard d. Ozaki in 2 sets – A little concerned about Bouchard’s health after she looked to be struggling (possibly with concussion-like symptoms?) in the Kuala Lumpur final but giving her the benefit of the doubt. Vekic d. Pironkova in 2 sets – Pironkova won their last match, 6-1 6-0. 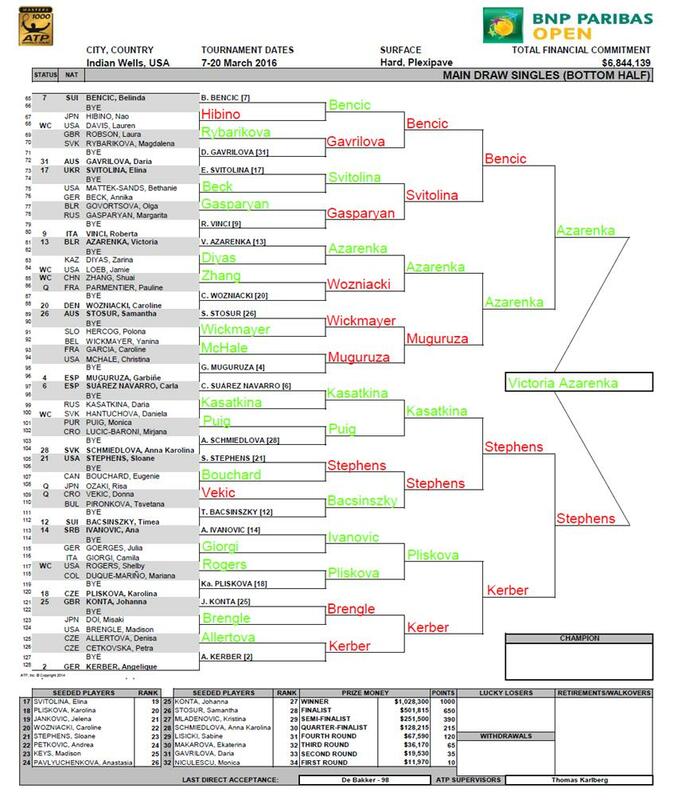 However, Pironkova has lost her last six matches at Indian Wells and I like Vekic as the qualifier in this one. Giorgi d. Goerges in 3 sets – I think this is a good match-up for Giorgi, Goerges won’t have time to wind up on her strokes. Brengle d. Doi in 2 sets – Doi won their first three matches in straight sets and then Brengle came out of nowhere to win in straight sets in Linz last year. Both have had their moments so far this year. Aside from reaching the final in Kaohsiung, Doi hasn’t won a match anywhere else. I’d have a bit more faith in Brengle in this one who is tough to break down. Allertova d. Cetkovska in 2 sets – Love both of their games but Cetkovska didn’t look healthy (lots of strapping) at the AO and is consistently troubled by injuries. 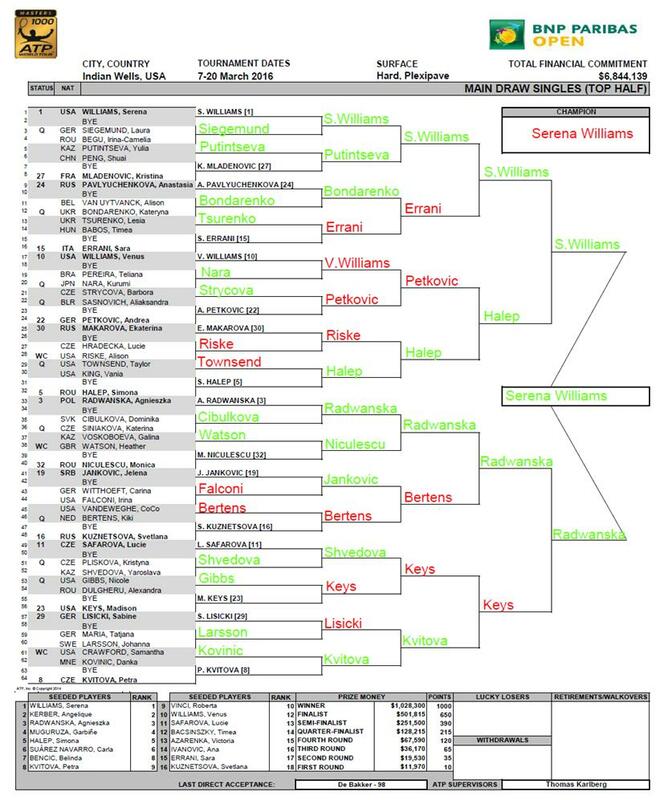 Thoughts – I’ll take that for day one, IW is normally a disaster! The Bertens pick didn’t work out so well but pleased to have gone with my instinct on Tsurenko over Babos. Siegemund d. Begu in 2 sets – Begu has played just two tournaments this year due to a knee injury while Siegemund will be adjusted to the funky court dynamics having come through two rounds of qualifying. Putintseva d. Peng in 2 sets – Wonderful to see Peng back in singles action and while I think she is the better player, it will most likely take some time for her to get back to where she belongs. Poots for the win. Bondarenko d. Van Uytvanck in 2 sets – Bondarenko won their only previous match in qualifying for Monterrey last year. Bondarenko powered through two qualifying matches for the loss of just eight games and has looked dangerous all year. Tsurenko d. Babos in 3 sets – Tsurenko has yet to win a match all year while Babos has been in super form… yet for some strange reason, I think Tsurenko might snap her losing streak here. IW often produces peculiar results and I think this could be one of them. Nara d. Pereira in 2 sets – Nara didn’t drop a set in her two qualifying matches and Pereira hasn’t won a set, let alone a match in 2016. Riske d. Hradecka in 2 sets – Hradecka has won just two out of her eight matches this year. Riske hasn’t done much since the first week in reaching the final of Shenzhen, but I think she wins this one. Townsend d. King in 3 sets – Thrilled to see Townsend winning matches again after a rough year. Also nice to see King back too! Going for TT to build on her impressive pre-qualifying and qualifying results. Cibulkova d. Siniakova in 3 sets – This feels like a match-up where Cibulkova may struggle. Siniakova is a competent player and i’d fancy this to be decided in three tight sets. Watson d. Voskoboeva in 3 sets – It’s difficult to trust Watson in the early rounds, even after she won Monterrey. I think she will get through this one but might go the distance, even with Voskoboeva so early on in her comeback. Shvedova d. Kr. Pliskova in 3 sets – Could go either way, their last match went to 8-6 in the decider. Gibbs d. Dulgheru in 3 sets – Gibbs has had a superb year, successfully qualifying for 4 out of 4 WTA tournaments. I just wonder whether she has enough left in the tank after a long qualifying match on Tuesday? Larsson d. Maria in 2 sets – Maria has won just one match this year and while i’m doubting every match here, I think Larsson comes through. Kovinic d. Crawford in 3 sets – Kovinic won their last match at the AO, would fancy a closer match but still favouring Kovinic. Crawford hasn’t pushed on since Brisbane but is still producing wins here and there.